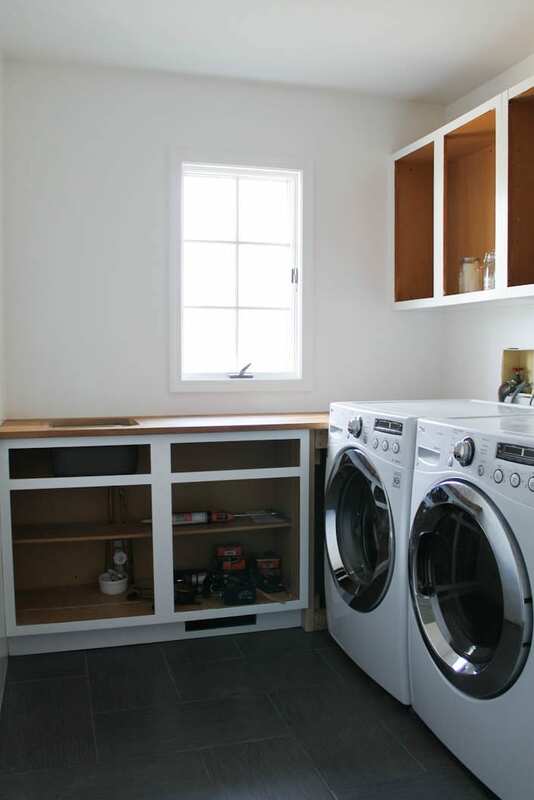 At the start of 2015, we began renovation on our laundry room/mudroom. 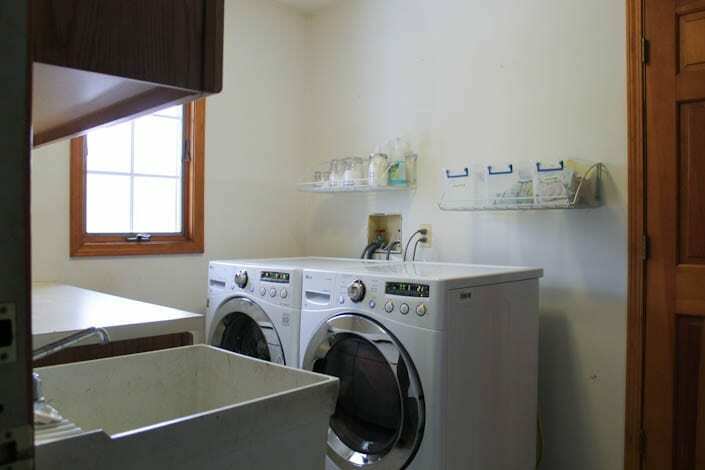 We were happy to have any laundry room at all; but with a family of 7 it could use some improvement. We only recently finished the final touches on the space, and it’s been bugging me this space hasn’t been blogged or “revealed” for 9 months. In hindsight, it’s a good thing, now I can tell you it has worked for our family! 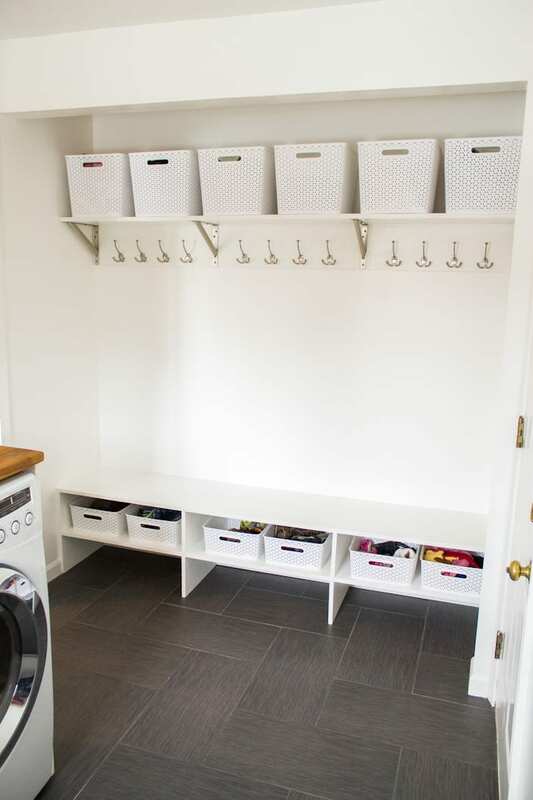 It’s a real-life (awesome) example of a small laundry room that works. It works great for our family with our muddy shoes, backpacks, giant snow pants, gigantic baby carseat, and our million loads of laundry. 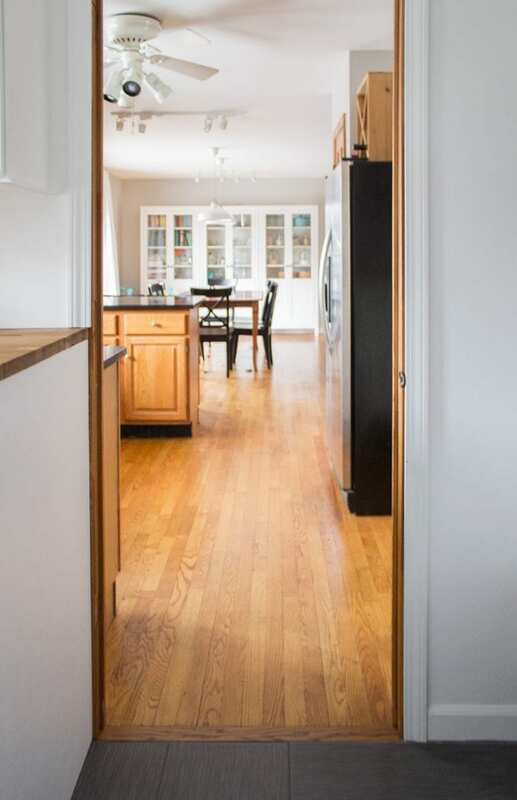 The best part of this renovation? We mostly worked with what we had and made it better. 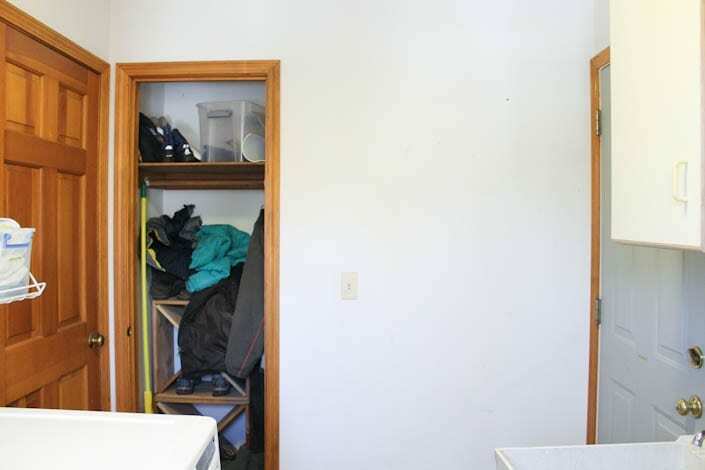 Most everything has a place so outside of cleaning actual mud off the walls, so it is easy to clean up. Yep, it’s the same room! 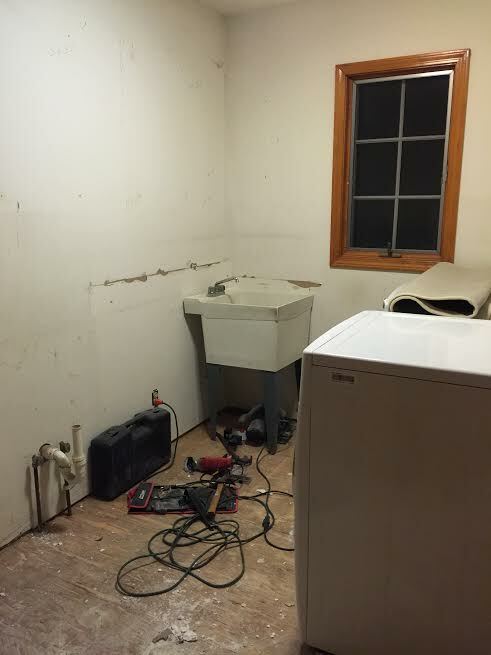 To start the project, we took out the cabinets you see on the left of the picture, as well as the utility sink (loved its size, but needed space). 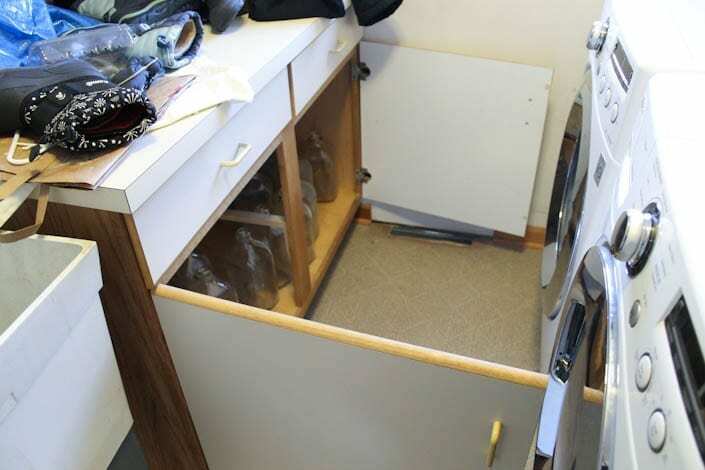 Took off the cabinet fronts, cut the bottom cabinet to make it less deep, pieced it back together, painted both uppers and lowers, and slid the washer and dryer closer to the door to the house. The bottom cabinet is now under the window. 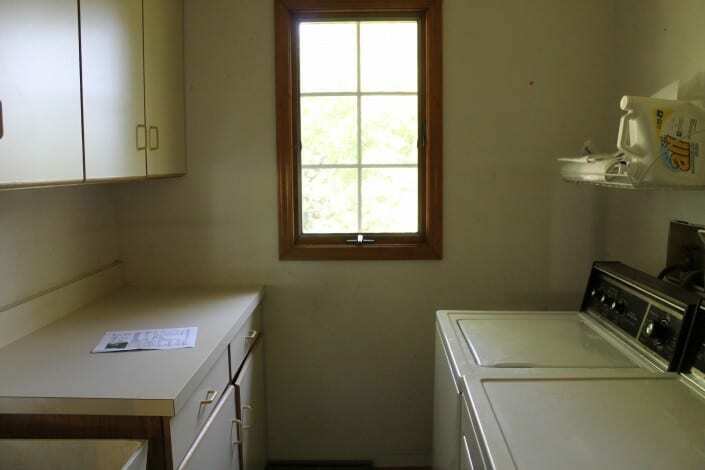 The upper cabinet is over the washer and dryer. We also moved plumbing from one wall to the area left of the window, added a butcher block counter, and a bar depth sink. I add that in as if it was an easy task, it was one of the hardest parts. We bought oak butcher block from IKEA, cut it down to fit the 18″ deep bottom cabinet. 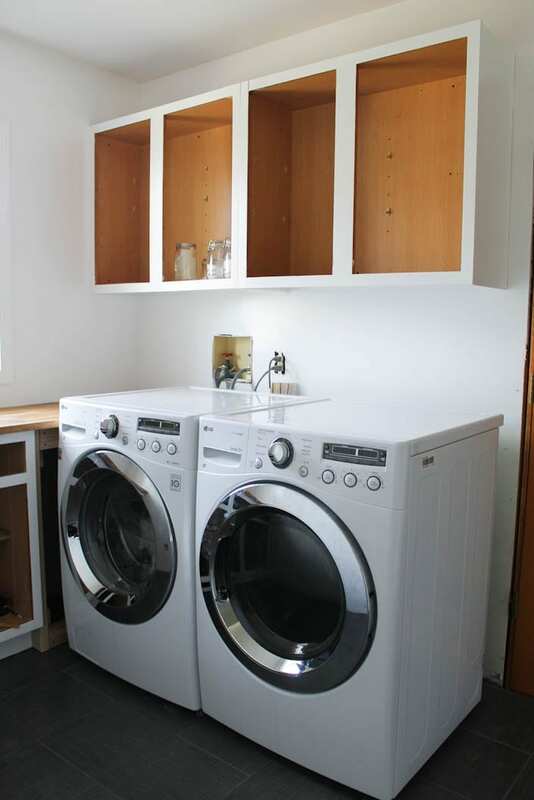 We also built a base for a cabinet on the the washer and dryer. We sealed it with butcher block oil, bought a new box for the hookups, then “hid” the hookups with pretty stuff. The basket was one I had on hand, I painted it white. 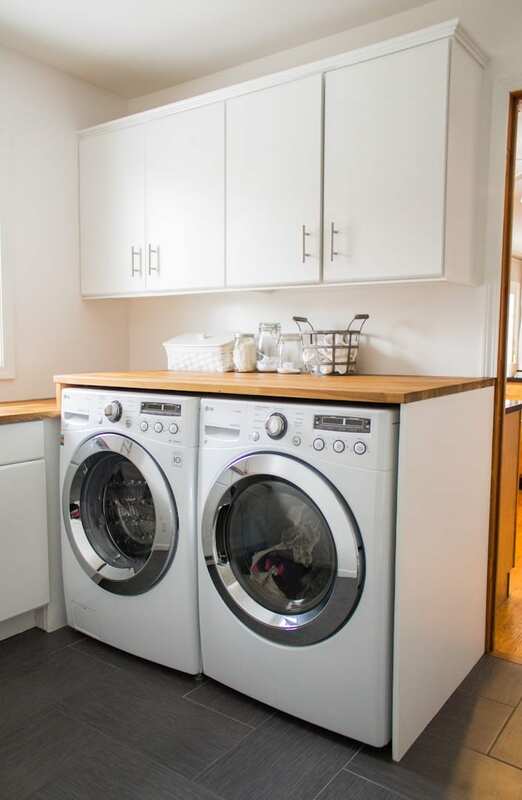 The jars hold dryer sheets, laundry detergent, and a natural laundry brightener. 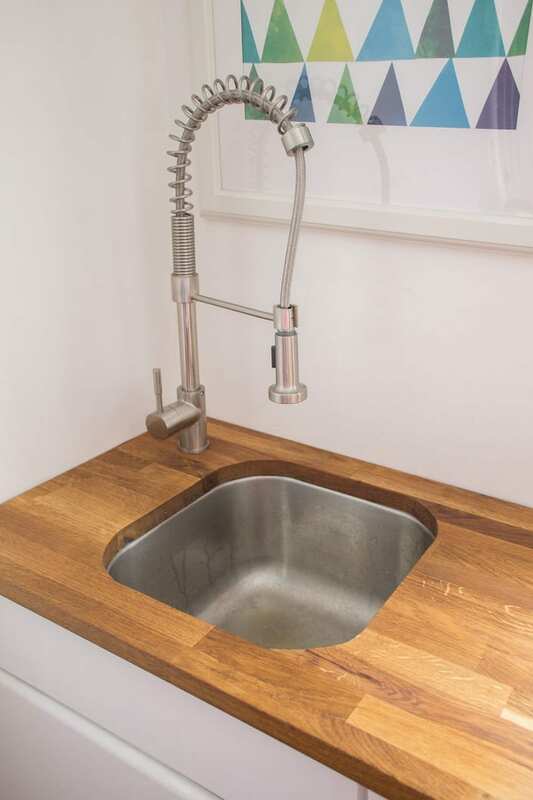 Finding a sink to fit this narrow counter top was a challenge. 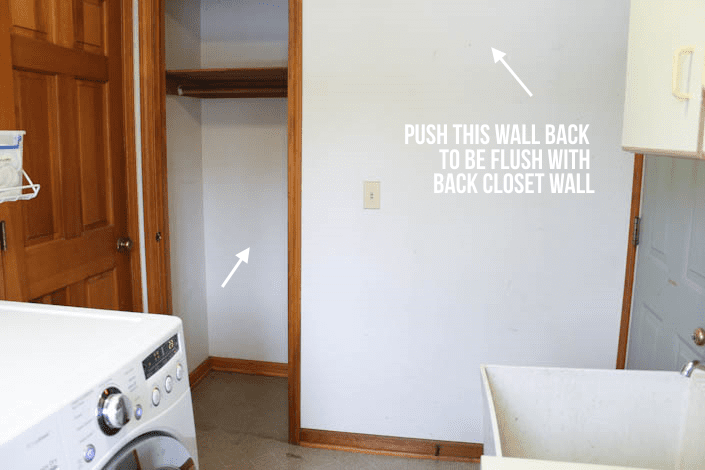 We cut the cabinet down and pieced it back together to fit in the 18″ gap between the washer and the wall. Hard to find small sinks that are also deep! 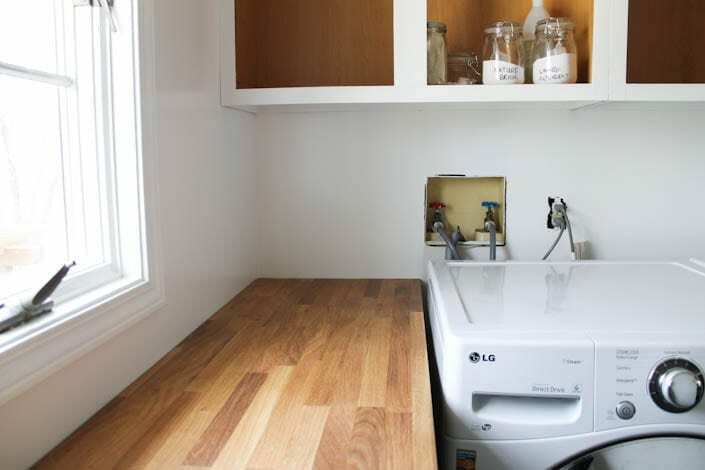 If you need one too, look for a bar sink or a prep sink. We ordered this sink on Amazon and it ended up being 16″ square and 8″ deep, deep enough to soak dirty laundry which equals perfect in my book. We bought the faucet on Amazon and liked it so much, we bought one for our kitchen too. The price was much lower than similar-design faucets, but it has held up great for us (as of this post, almost a year of use). 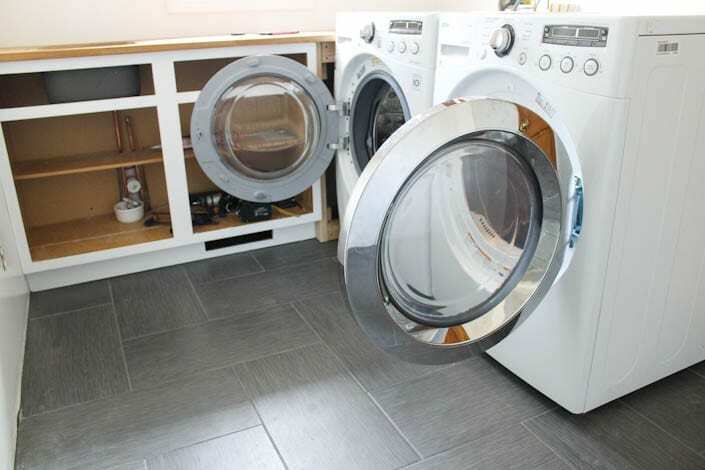 The cabinet bases are wood, but the cabinet doors are laminate. We weren’t sure if painting the laminate doors would work, but I found this alkyd interior paint, recommended by our local Sherwin Williams store. It has held up perfectly with no chips or problems after a year. 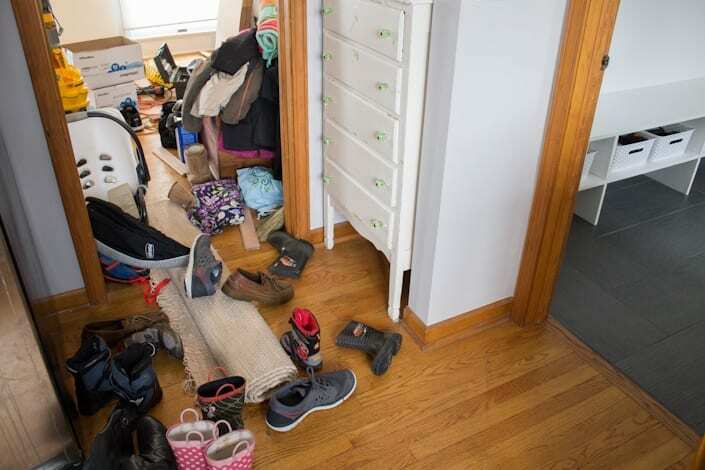 This is one area we were really excited about (see messy closet pictures/why here). We had a nook in the room behind this wall that we didn’t need and this room needed more room. The pictures explain what we did better than my words can. My dad is a carpenter and Doug is pretty handy, which is what you need if you want to do something similar. 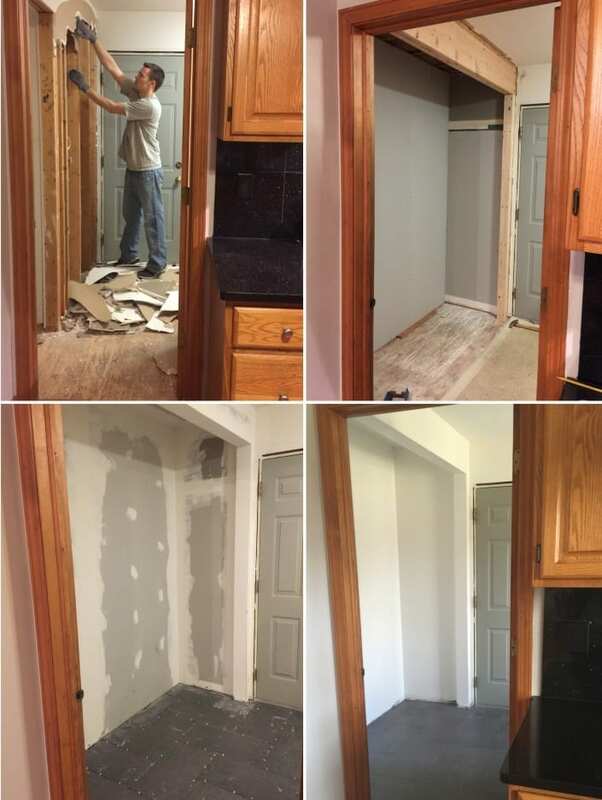 Doug started by taking out the trim and ripping out drywall. I’m going to spare you my amateur version of the specifics, but basically they cut things, jacked the ceiling up with temporary supports, and pushed the wall into a new spot. Only attempt this if you are also working with someone who knows what they’re doing. 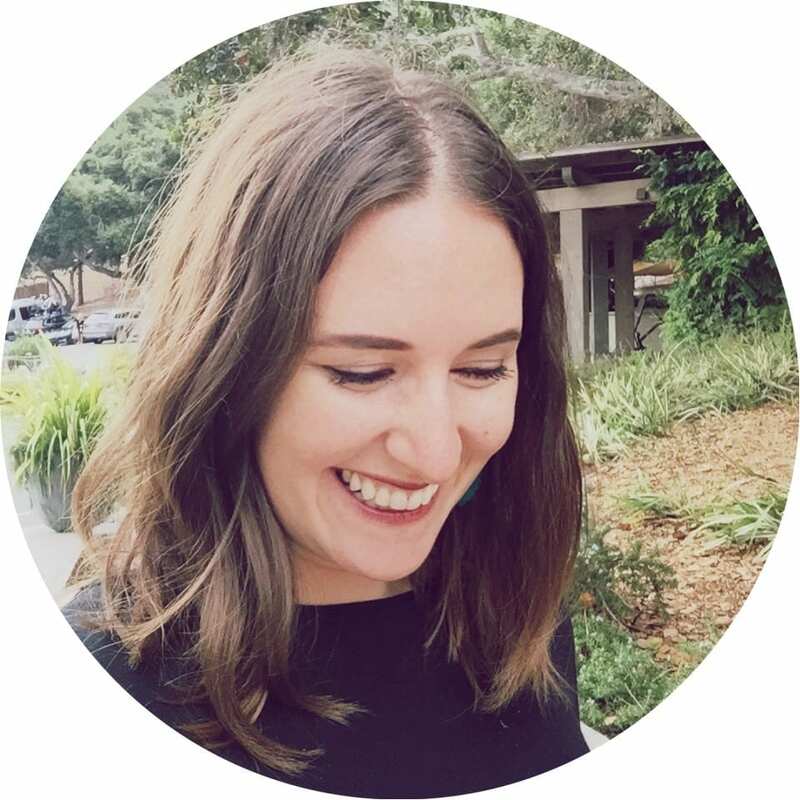 If you aren’t, hire this part out; it is worth it. 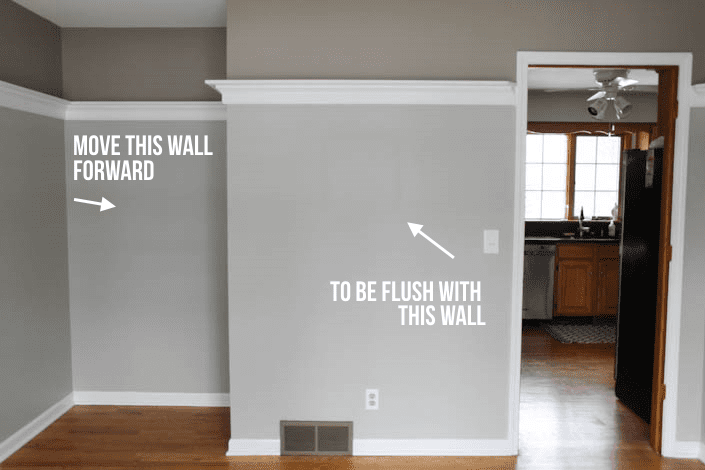 We weren’t too sure if any of these walls were load bearing or not, it turns out half of the wall was? Or so I’m told? So we ended up having to add a beam; unlike everyone on HGTV who freaks at the mere mention of a beam, it was no big deal to us. Here’s the before and how it looks now. …and I have no picture of this part. 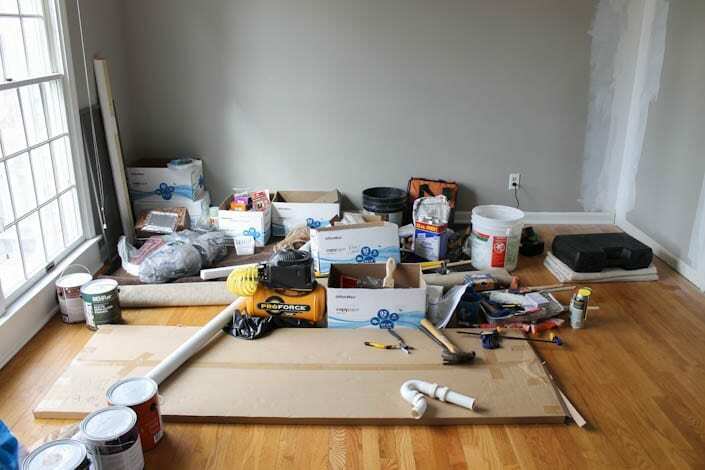 Another part of our home is being renovated right now and a similar mess is in here, haha! I will update this when I can. 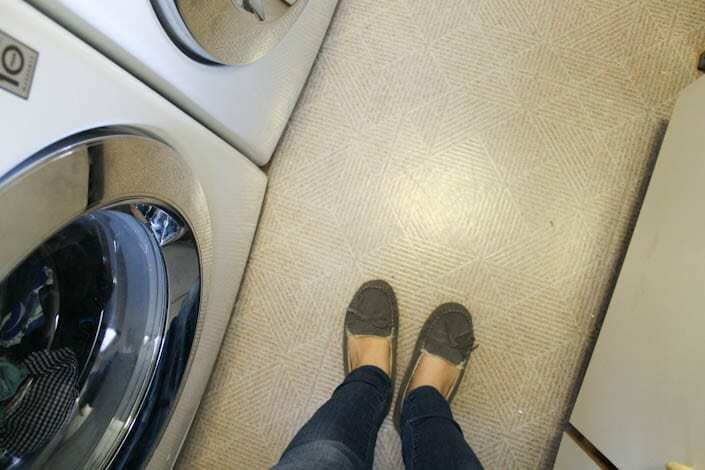 I don’t mind linoleum but ours was showing wear. 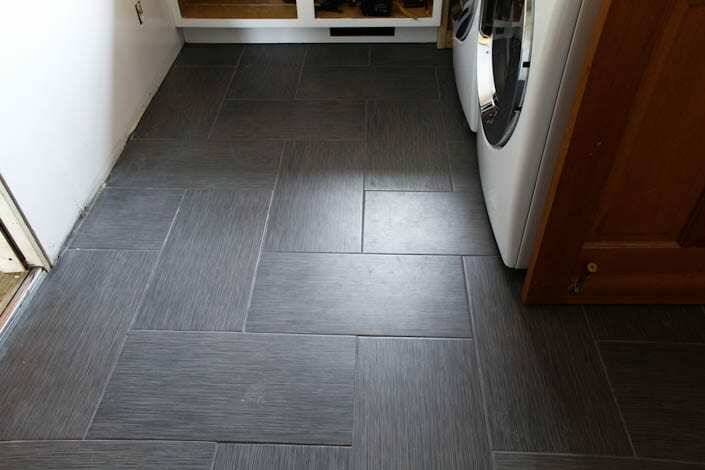 We ripped it out and replaced with this 12 x 24 porcelain tile from Home Depot and laid them in a herringbone pattern. I’m so happy with how they turned out! To keep things simple, we painted the walls, trim, and cabinets all the same color, Behr “Polar Bear” in semi-gloss. 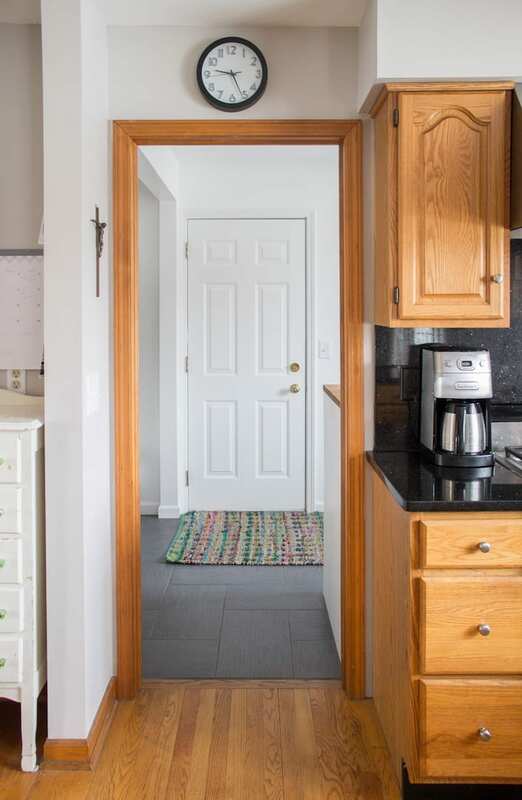 To paint the trim, cabinets, and laminate cabinet doors, we did our regular method of lightly sanding, coat with Zinsser Cover Stain, then a few coats of the paint (sanding any drips or imperfections in between coats). We also added crown moulding and a trim piece on the bottom to finish them off. The hardware is from Home Depot and came in a lot of sizes, we picked one to fit the old handles and avoid drilling new holes. 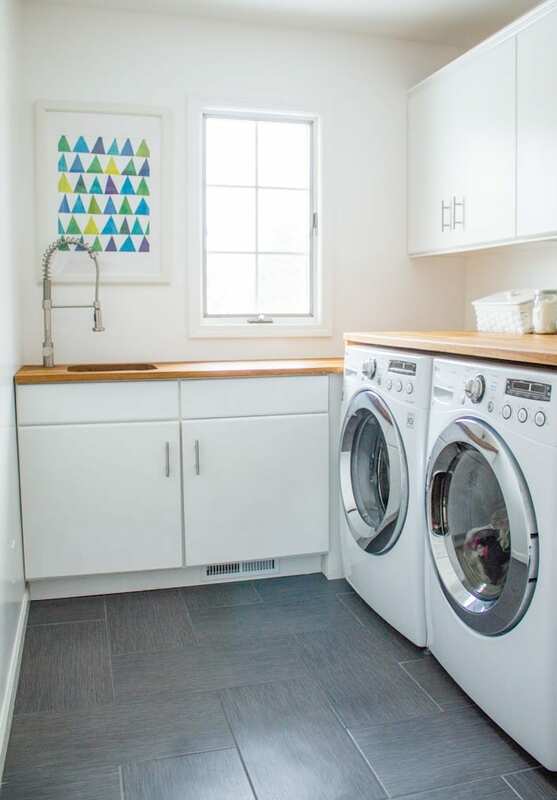 You may think I’m nuts for going white in a laundry room/mudroom for a family of seven. My reasoning is that it’s a small room that is going to see a lot of messes. 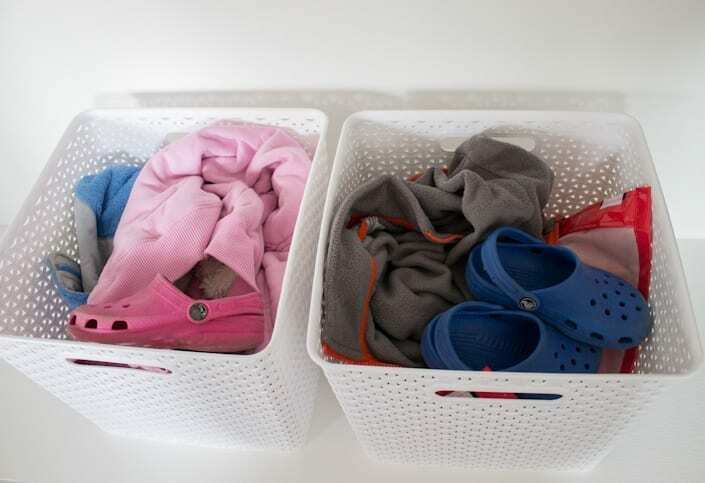 Laundry, coats, shoes, dirt, crap on the countertop… they all will add color and clutter to the room. Maybe it looks sterile to some, but that’s what I wanted: the illusion of a clean room. 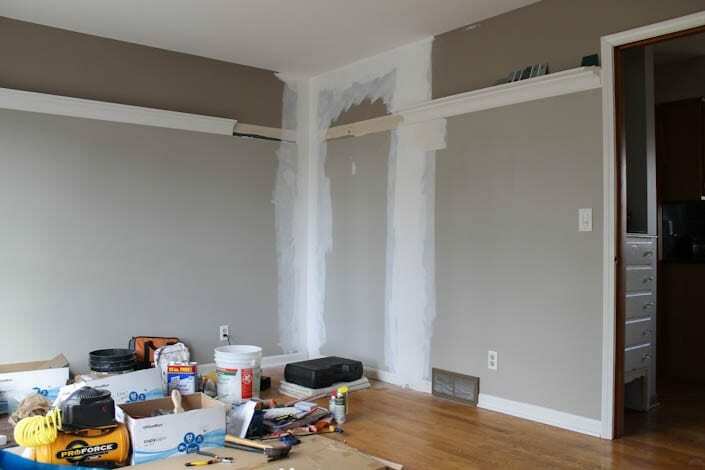 We used a semi-gloss and it’s helped, the walls can easily be wiped down. And finally, a bit of real life. I always see comments on Instagram or Facebook or wherever saying “ahh, jealous!! !” I know nothing is meant by the word jealous, but I always laugh because it is said whenever we went through a lot of crap to get to the beautiful after. Here’s the space with a bit of life in it. Again, this is a CLEANED UP VERSION of how it normally looks. 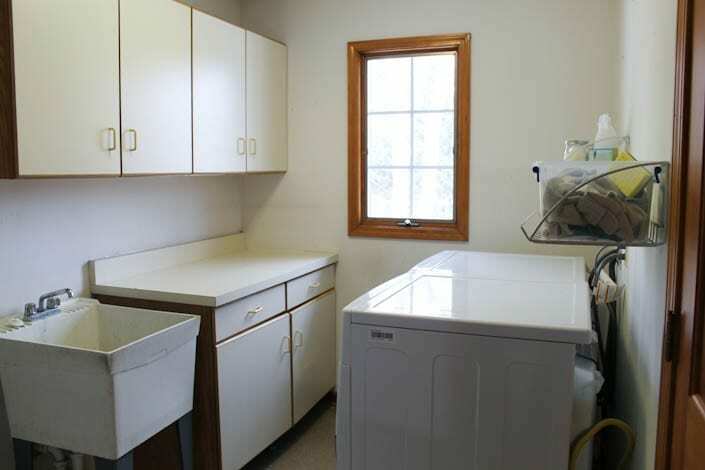 I’m so thankful we even have a laundry room. I’m happy we’re taking steps to make it better. Like the rest of our projects, I am proud of the fact that we can put hard work into something and get such a great result. Which is why I share this project with you. 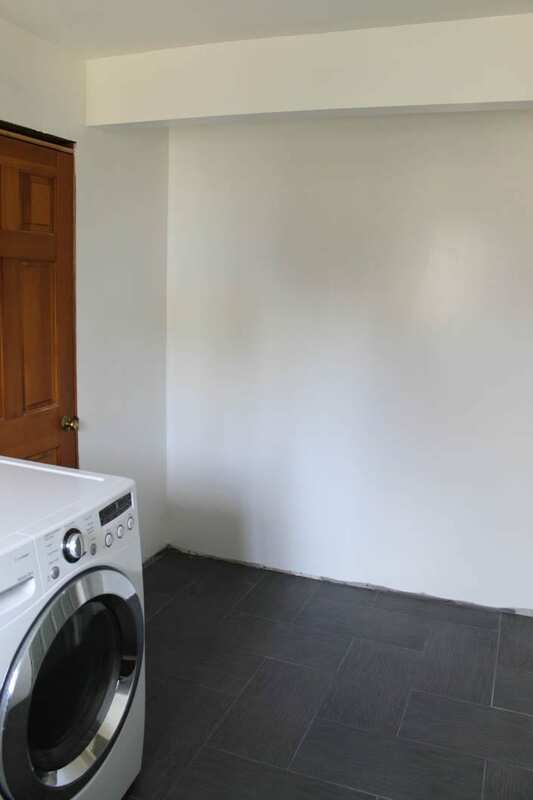 We didn’t call in the Property Brothers (although I would die if we could), nor did we blow out walls, move everything, and spend a fortune on this space. All we did was move half of a wall, get resourceful with what we had, buy some countertops and hardware, and painted everything in here. 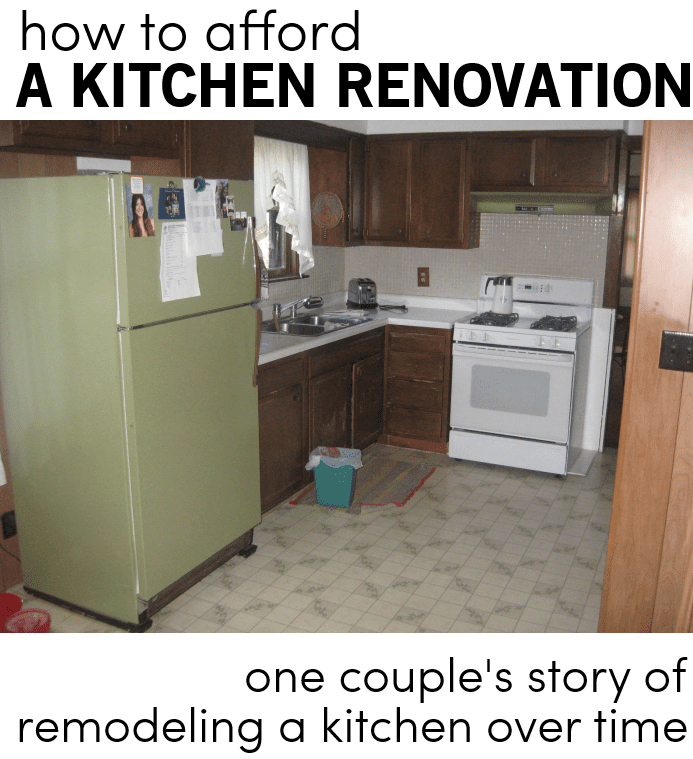 How much was the butcher block? Looks great. 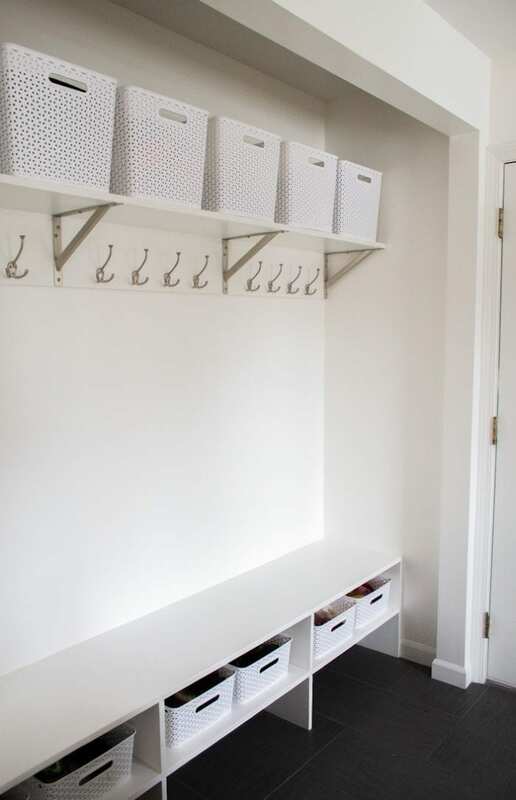 Where did you find the shelving with the hooks? Thank you, Lori! The shelf is really a 2×8 mounted into studs in the wall, then a bracket mounted to that, and a 2×12 mounted up top to the bracket. The hooks were then mounted to the board. Both the brackets and hooks are from Home Depot. Helps a lot. Thanks for the info. This will be our Thanksgiving weekend project. Looks great! I love the white! I love the white – I agree with you, it looks CLEAN! 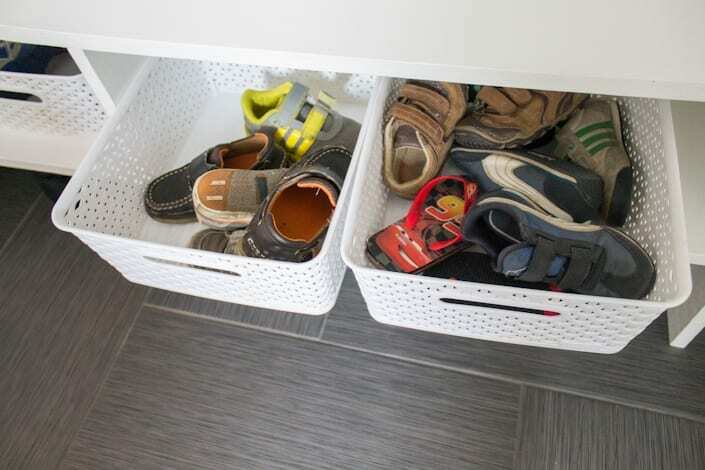 I absolutely love the family closet hanging/basket area! 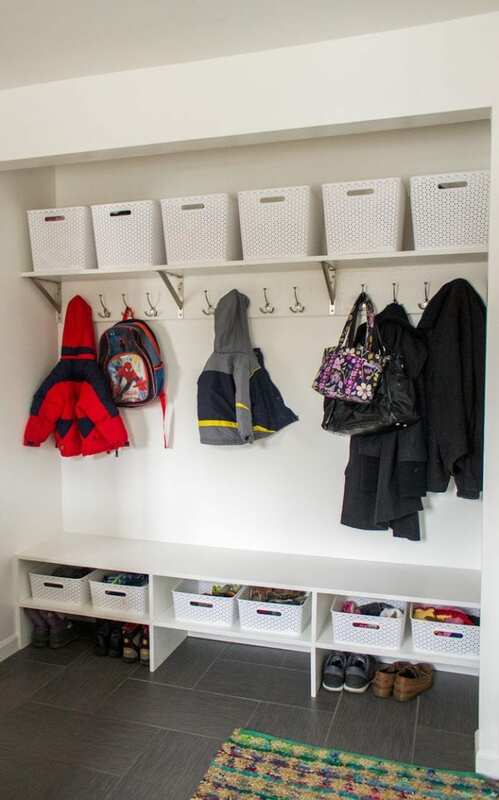 I don’t see a lot of details about the shelving, hooks, baskets. Was that all custom done by you guys to make it fit your space? Looks SO good! Would you mind giving a breakdown on cost? I will get back to you with that! I will update the post and reply to your comment. There were a lot of hidden costs for the plumbing and stuff. Hi there! I am new to your site. I just came across your page on Facebook and had to see how this turned out. It looks great! I love the new sink and the countertops. 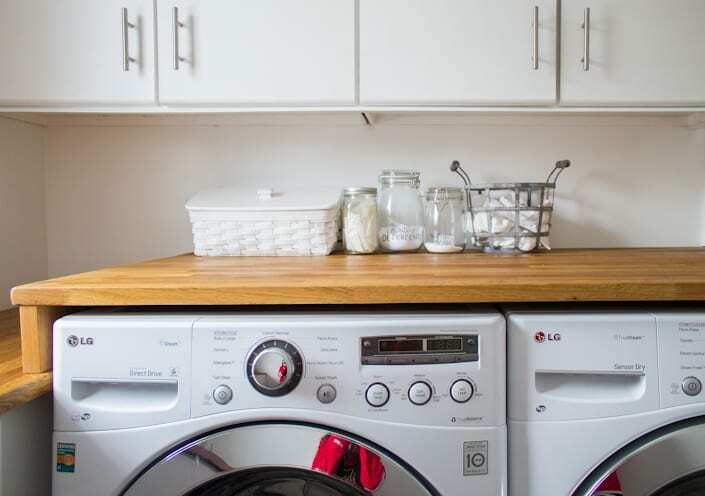 My husband and I have tried using different kinds of wood for laundry counters in past homes and haven’t found one we like (they have all been to scratchy or cheap looking) so we may have to go with butcher block! Thanks for sharing. Jessie, we’ve been really happy with them! I will caution to be careful with them, I don’t set wet clothing on them. I’m worried either the wetness will make a spot or the butcher block oil will rub off on the clothes. You guys did an amazing job! It looks fabulous!! !